This is a photo from one of my favorite websites. 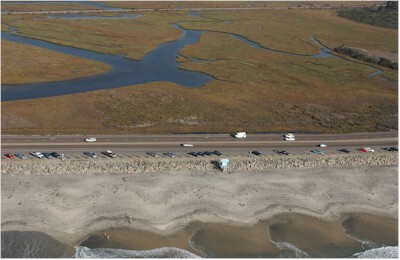 It's a brand new site made by a guy who has helicoptered up and down California taking photos of our coastline. This photo was taken on Wednesday, October 30, at around 1:30 in the afternoon, when I happened to be parked at the beach grading papers for my evening chemistry class! And that's my car down there, the 6th one to the left of the lifeguard station. Strange, isn't it? I remember a helicopter going by. Too bad I didn't get out and take a picture of it.